It does everything really, really well, and while it may not truly excel in areas such as screen resolution and camera quality, the OnePlus 3T is still astonishingly good value for what is a serious flagship contender. Update: Android Oreo has started rolling out for the OnePlus 3T, but if you want a bigger upgrade the OnePlus 5T has also now launched. The OnePlus 3T is something of a surprise offering. It’s a phone we didn’t expect the Chinese startup to launch when it unveiled its 2016 flagship, the OnePlus 3, just six months prior to the 3T’s arrival. But here we are. The OnePlus 3T has killed off the OnePlus 3 after half a year, but now the 3T is dead as well thanks to the arrival of the OnePlus 5 and OnePlus 5T. The 3T wasn’t a completely new phone – even OnePlus admits that, instead billing it as new variant of the 3, and too right - the OnePlus 3T has the same design, screen, RAM, rear camera and fingerprint scanner as the phone it’s shoving out of the limelight. It’s not like the OnePlus 3 had any major flaws either – it scored a highly respectable 4.5 stars in our in-depth review, and comfortably made it into our list of the top 10 best phones in the world. So why the new model? OnePlus tells us its engineers found solutions to some nagging issues on the 3, and they didn’t want to wait another six months for the OnePlus 5 launch on June 20, 2017. That means you’re getting slicker performance, longer battery life, a punchier selfie snapper and a new storage option – at a slightly higher price. It’s a move that’s likely to frustrate early adopters of the OnePlus 3, as the company they’ve put their faith in has suddenly relegated their handset to a second-class citizen, and relatively soon after its launch. All that aside though, the OnePlus 3T is another stellar offering, with super performance, a strong feature set and a still-reasonable price tag. In a rush? Check out our OnePlus 3T video review below! Update: The OnePlus 3T is no longer on sale. OnePlus has ceased production and removed it from its website. It has been replaced by the OnePlus 5, which itself has now been replaced by the OnePlus 5T - the only phone you can now buy from the firm. You had to pay more to own a OnePlus handset with the 3T. The firm’s cheaper OnePlus X had been dead for a while, and the OnePlus 3T price started at $439 (£399, around AU$580) for the 64GB model. That’s up from the $399 (£329, around AU$450) for the OnePlus 3 – but there was another storage/price option with the OnePlus 3T. OnePlus introduced a new 128GB storage option for its fourth generation flagship, which set you back $479, (£439, around AU$630) – it's a move that will likely delight some users, with the firm continuing to shun expandable memory features such as a microSD slot. 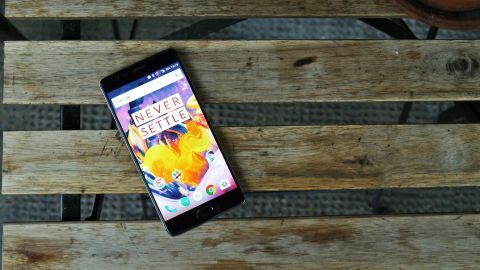 The OnePlus 3T went on sale in the US on November 22, while Europe had to wait a few more days for its OnePlus 3T release date of November 28. We’re not going to spend too much time talking about the design of the OnePlus 3T. Why? Because it’s identical to the OnePlus 3, and we mean identical. Same weight (158g), same size (152.7 x 74.7 x 7.35mm), same aluminum uni-body, same rear camera protrusion, same factory fitted (but removable) screen protector…. you get the picture. In fact, the only new feature design-wise is the addition of a new color variant for the 64GB version: gunmetal. This is a darker grey than the silver which adorned the OnePlus 3, and joins ‘soft gold’ to offer two shade choices. The 128GB OnePlus 3T only comes in gunmetal though. OnePlus introduced a limited edition color for the 128GB model more recently, but the Midnight Black hue has sold out is most regions - so you'll be lucky to get hold of it now. The OnePlus 3T is still a premium-looking and feeling device, which doesn’t look out of place alongside the Samsung Galaxy S7 Edge, iPhone 7 Plus and LG G5. However there are newer flagships on the market, and the Samsung Galaxy S8 and LG G6 push the design envelope even further - the OnePlus 3T hasn't been left behind, but it doesn't look quite so good next to 2017's Android flagships. Considering the OnePlus 3T is comfortably cheaper than all of these handsets though, it’s still rather impressive. In the run-up to the OnePlus 3T launch there were several reports suggesting the new phone would drop the AMOLED screen technology used on the OnePlus 3 in favor of a LCD screen – luckily that didn’t happen. This allowed the OnePlus 3T to maintain the same slim profile and bright, vibrant display. The AMOLED panel on the 3T also features the same Full HD resolution, resulting in a 401ppi pixel density. What that means is text, images and video are clear and smooth – although the display lacks the supreme clarity of the QHD-toting LG G6 and Galaxy S8.